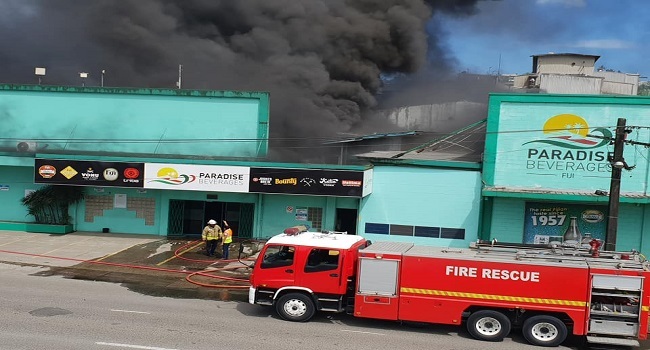 The National Fire Authority will begin its investigation today to determine the cause of fire at Paradise Beverages brewery in Walu Bay, Suva yesterday afternoon. Chief Fire Officer, Qionilau Moceitai says it took firefighters more than four hours to contain the fire from spreading to other parts of the building. NFA says it is understood there was a storage room located above the administration rooms which contained a lot of flammable advertising material and would have contributed to the high intensity of the fire. He adds the team was able to contain the fire to the area of origin. Moceitai says the Suva Fire Station was alerted through its fire monitoring alarm system at around 2pm of the fire emergency. He adds upon arrival the fire team saw a portion of the brewery’s administration section on fire.